For 20 years, Masonic Village at Elizabethtown’s music therapists have explained and demonstrated the difference between therapy and entertainment. While all music therapists need to be musicians, not all musicians should be music therapists. Masonic Village music therapist – and accomplished pianist – Kim Glass describes the differences and intersections between music therapy and performance. Music is part of our title – Music Therapist, Board-Certified – and the primary tool we use to affect change, influence a response, and connect with our clients. Therefore, having excellent music skills is essential to success in our practice. It’s not just the basics of playing the correct notes and rhythms. Making music involves so much more. While Webster’s Dictionary defines a musician as “a person who plays a musical instrument, especially as a profession, or is musically talented,” music therapists not only play instruments but choose specific music for a specific purpose for specific people. Music therapy is about providing the right music at the right time. For example, if a client who has dementia is exhibiting anxious behavior, offering boisterous music with drumming may not be the best choice to redirect them or help them to feel calmer and safer. Think of your favorite song. You may hear a certain artist with specific nuisances in the melody and rhythm. The written notes don’t always line up with what we hear an artist present. Music therapists must produce music so our clients can recognize and connect to the songs they remember. We can then manipulate the song’s style – by altering the accompaniment, changing the register, accenting familiar rhythmic patterns and more – to cue a movement or rhythmic response. The skills we learn as musicians support and improve our work as music therapists. We provide live music experiences. Although we sometimes utilize recordings, we prefer making music with our clients over for our clients. Accurately playing or singing one’s part, counting beats, listening to and being aware of others and utilizing dynamics, phrasing and improvisation are some essential skills that are key to successful music therapy experiences. While training student music therapists, we focus much of our energy on building these skills so they can better meet the needs of their clients across various populations. The music is the vehicle which we use to accomplish non-musical goals, such as expression, increased range-of-motion, increased social interaction and memory stimulation. Flexibility as a musician is also imperative in our music therapy work. We use rubato, phrasing, tempo and meter alterations to create physical, mental, emotional and behavioral cues through music. For example, a music therapist may help a client in pain by using the client’s preferred music to cue deeper breathing and relaxation. How we use music matters in our work. Being a musician doesn’t make you a music therapist, but a music therapist must be an excellent musician. 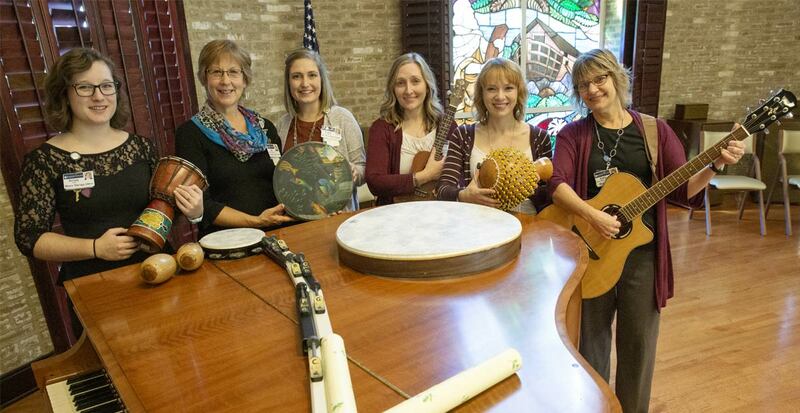 Kimberly Glass (third from right, above) received her bachelor’s degree in Music Therapy from Elizabethtown College in 2003, completing a student practicum and working as a Music Therapy Assistant at Masonic Village at Elizabethtown. She has been a board-certified music therapist there since 2004.